When leaders control followers, followers lose power. Control is a zero sum game until leaders use their power to expand the power of others. Disempowered people have two basic options: resist or go along. Resistance, in the form of complaining, is a disempowered person’s grasp for dignity and control. On the other hand, the choice to go along seldom energizes talented people. When leaders take control they make it easier for others and harder for themselves. Resistance is far easier than ownership and responsibility. Going along is safe. Don’t expect exceptional energy from people who are just going along. Words are rudders. Conversations establish direction. The most powerful act of leadership is providing focus to conversations. But keep in mind, conversations are two way – not one way – engagements. The more one person talks, the less power others feel. Expand power by sharing control. A client of mine recently gave power by letting go of control. Like most of us, he’s a control freak. Instead of telling people what to do, he focused the team’s conversation on a shared goal. I love the question he asked. “With (insert challenge/problem) in mind, what keeps you up at night?” His question is human, compassionate, others-centric, open, and meaningful to organizational success. He had intended to show up with a plan in place. Instead, he led a conversation that energized the team. They’re part of the plan because they are making the plan. People with energy don’t need to be pushed. Conversations take longer than monologues. But if time allows, forward-facing conversations energize talented teams. The idea of going slow to go fast comes to mind. 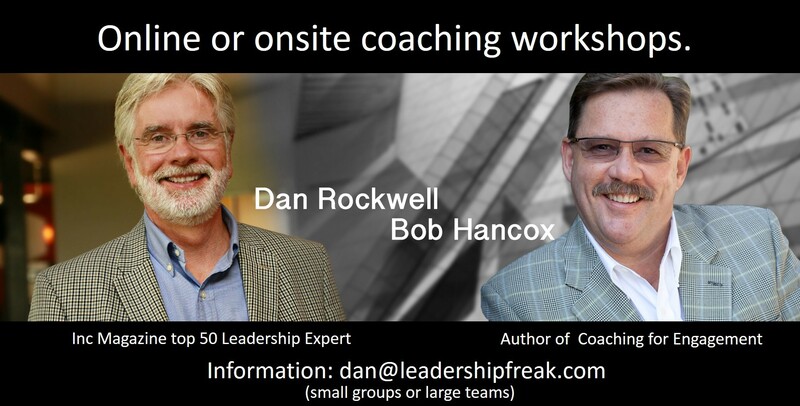 What is essential for leading conversations that give control, more than taking it? While this post is intended for organizational success, all I can think about while reading it is my children! Parenting is leading. Children resist often or go along, sadly, reluctantly resigning themselves to whatever it is that they do not want to do. Kids often feel powerless. I don’t like that feeling – why should they? It’s not always easy to include kids in the decision-making process; it gets messy, you get off track, they have unrealistic expectations. I’ve found that when I let go of control, things go more smoothly, there is less resistance, and there is more happiness for everyone, including me. It takes trust, caring, and respect to take that leap but it is worth it in the end…. Liked the post. 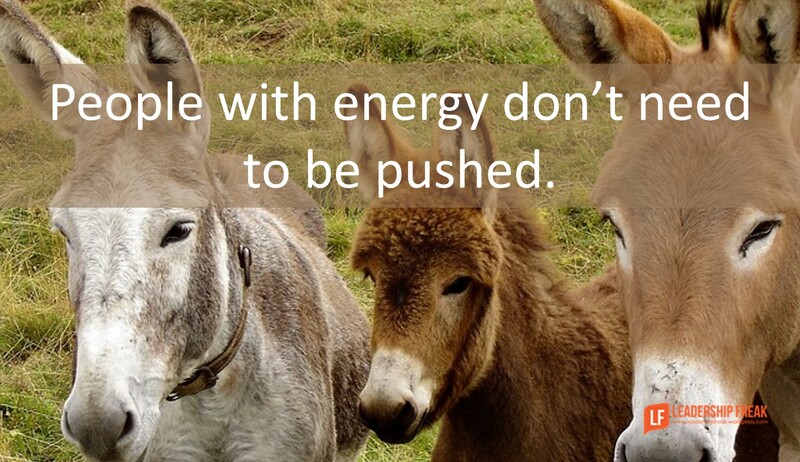 It’s true that people with energy don’t like to be pushed. They are self-driven and can work towards the shred goals. I think, leaders need to work in enthusing people to get involved and contribute individually first per their defined roles. Leaders are required to focus more on productive people with energy and leave the task of pushing to tough managers. and it reminds me that all interactions are opportunities.. I’m sometimes amazed when someone says “do you remember the conversation four years ago..?” (and I often do not) the point being I’m not always so good at identifying these high value moments.. I’m better of regarding every opportunity as a valuable, and being intentional. Great post, Dan. Two quick thoughts: First, too much (media) time is spent on identifying zero-sum games or situations (one wins, one loses) and not enough on identifying positive-sum situations (where everybody wins because identified Value is Added: http://wp.me/p2k440-2D). Second, it’s tiring having to spend time “pushing” low energy/unself-motivated people. It’s more efficient to find and develop the “pullers” and get out of their way (of course, while remaining along side of them – you get to witness and enjoy the results! : http://wp.me/p2k440-7y and http://wp.me/p2k440-7P). I once had a few amazing bosses. They told me to find problems and fix them. Call them if I need help but I have the authority to do what needed to be done, just use some common sense if the costs are high to notify them. I remember the first time I contact them about spending a couple $1,000. I said I think we should do this and if I’m right the saving should be about triple the costs yearly. He said, “Mike you know the right thing to do. Why you bringing it to me?” He had a big smile on his face and told me to keep up the good work. I never worked so long and hard in my life and loved every second of it.